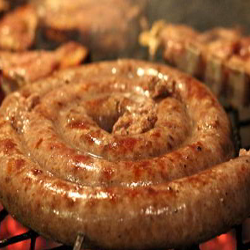 Sometimes only a boerewors roll will satisfy the hunger! If you have ever been driving around and racked your brain for the location of that guy making boerie rolls outside the supermarket or the butcher in the middle of the day and have traveled about 10km to find one, then you know you are a born and bred South African! Pop the coriander into a hot pan and toss it around for while until you smell that beautiful coriander fragrance quite strongly. Pop it into a pestle and mortar grind it down to a powder, removing any husks and then combine with the rest of the spices. Cut all of the meat into small chunks and combine with the spices. Put the meat and spice mixture through a grinder or a food processor (make small batches if you are using a food processor). Now add the vinegar to the minced meat and mix thoroughly. Set it aside for about 1/2 an hour to combine nicely. Stuff meat lightly into casings and get the braai ready!